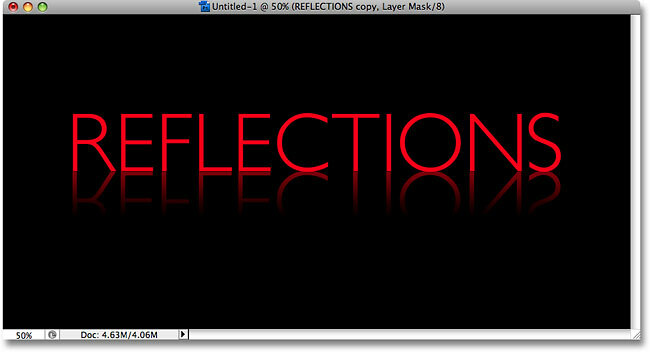 In this Photoshop text effects tutorial, we're going to create a simple text reflection effect. This effect has been used everywhere in advertising, and as we'll see, it's very easy to do. The final text reflection effect. Create a new blank Photoshop document. Select Black in the Contents section at the top of the Fill dialog box. The background of the document is now filled with black. Choose a color for the text by clicking on a color swatch in the Swatches palette. Add your text to the document. Click on the checkmark in the Options Bar to accept the text. Use Free Transform to resize and/or move the text if needed. When you're done, press Enter (Win) / Return (Mac) to accept the transformation and exit out of the Free Transform command. A copy of the text layer appears above the original. Go to Edit > Transform > Flip Vertical. The copied text layer appears upside down in front of the original text. Drag the copied text down until it's just below the original. Click on the Layer Mask icon at the bottom of the Layers palette. A layer mask preview thumbnail appears on the copied text layer in the Layers palette. Click on the gradient preview area in the Options Bar. Select the black to white gradient from the Gradient Editor. With the Gradient Tool and the black to white gradient selected, all we need to do now is draw a vertical gradient along our upside down text. First, make sure you have the layer mask selected, not the layer itself. You should see a white highlight border around the layer mask thumbnail in the Layers palette which tells us that the layer mask is selected. Click on the layer mask preview thumbnail to select it if you don't see the highlight border around it. Click and drag a black to white gradient vertically along the upside down text. The bottom text now fades into transparency after drawing the gradient on the layer mask. The layer mask preview thumbnail shows the actual black to white gradient. Lower the opacity of the layer to fade the reflection even more.